OKO XT represents a true breakthrough in sealant technology. With its unique ability to combat snake bites and deliver a winning ride, OKO XT says ‘Who needs mousse?’ – XT will give you the confidence to reduce tyre pressures and improve traction. 800ml bottle. For most motocross and enduro motorbikes, use 250ml front tyre: 350ml rear. One bottle covers 2 tyres and you have some in reserve. For mopeds and scooters with inner tubes, use 250ml in front and rear tyres. Simple fitting using the valve core remover and filling tube supplied in every bottle cap. 25 litre drum is ideal for retailer and service workshops and team support garages: the NEW heavy-duty adjustable all-alloy drum pump is a one-time purchase and can be rinsed out again and again for repeated use in filling tyres rapidly. NO ADVERSE AFFECT UPON TYRES OR RIMS (contains anti-corrosion agents that protect steel and alloy wheels). DO NOT USE with CHROME PLATED WHEELS which are fragile and can react to any chemical. 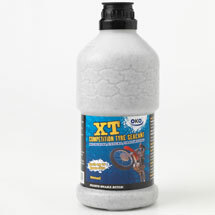 Enhances the durability of INNER TUBES; and is essential for TUBELESS DIRT BIKE TYRES. QUANTITY REQUIRED ­ for all normal motocross or enduro tyres – 250ml front, 350ml rear.